For weeks leading up to this new production of Julius Caesar, the Royal Shakespeare Company (RSC) was tantalising Twitter users to declare if they were #TeamCaesar or #TeamBrutus. Thinking I'd be Caesar all the way, this moving and bloody new version managed to twist and turn my emotions so I wasn't so sure. 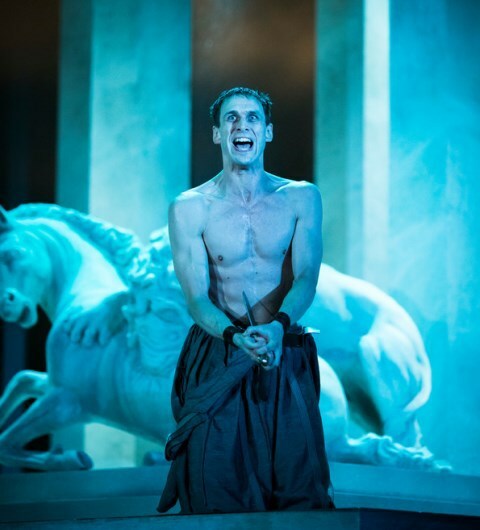 Julius Caesar is part of The RSC's Rome Season in the Royal Shakespeare Theatre, which includes Antony and Cleopatra starring Josette Simon and then Titus Andronicus up to September, with more to follow. Season director Angus Jackson also takes the helm of Julius Caesar, which is a politically relevant piece for current times. 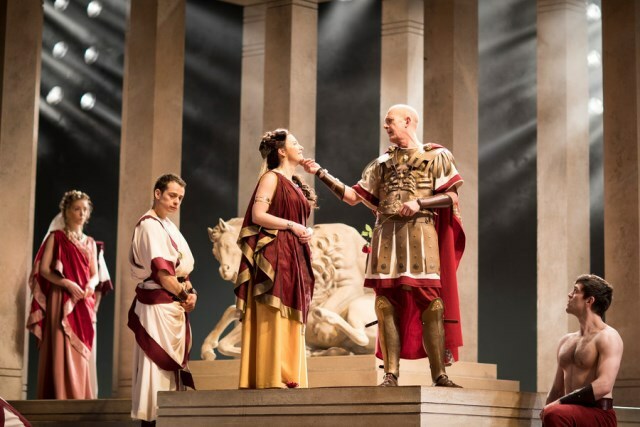 Historically, the Roman public were strong Caesar supporters as he championed the poor and the opening scenes of this play where the public is chanting and cheering his name have more than a passing resemblance to Donald Trump's rallies. The stage is swathed in eerie blue light for a gory opening scene where a bull has been sacrificed and its heart ripped out. There's plenty more blood to come and this reminds us of the brutal and superstitious period we are in. In the shadow of resplendent Roman marble columns are where the political whisperings and plots take place. Worries that the republican form of government is under threat from a Caesar, looking more and more like a dictator by the day. The weather plays a big part in this production, intensifying the drama with lightning storms and glorious red skies during the civil war scenes. It's during atmospheric rain storms that Caesar's fate is sealed and a decision is made to draw honourable Brutus into the rebellion. When the Ides of March arrives, it's a bloody, realistic portrayal of the murder. By the end of it, most of the cast are coated in blood, as is the stage, in this no-holds-barred portrayal. Director Jackson manages to shock with the violence, but more so in a later scene involving the brutal death of a child which drew the most gasps from the audience. 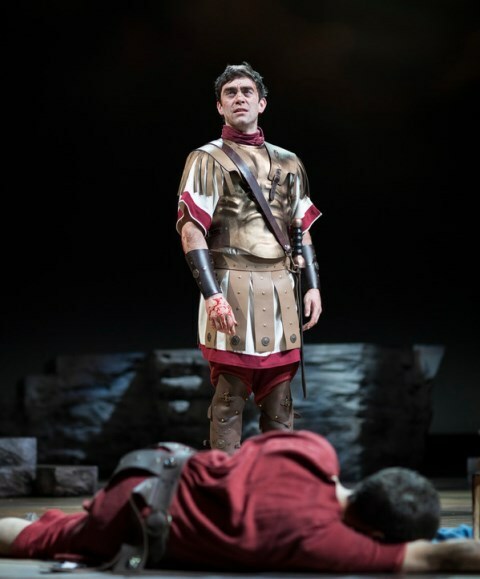 Playing Julius Caesar in impervious fashion is Andrew Woodall but the real highlights of this show are Alex Waldmann as Brutus and James Corrigan as Mark Antony. The scene where Mark Antony manipulates the crowd with his "Friends, Romans, Countrymen" speech is fantastic and one of the best scenes I have seen at the RSC. It's the ultimate political speech performed with the right amount of irony by actor Corrigan. Eloquently cunning the mob to his will, Mark Antony's speech whips up the crowd with an "us and them" mentality and plays heavy on his common man theme. I's as though Trump has taken lessons from this play as Mark Antony regales the crowd saying "I am no orator as Brutus is, you know me all as a plain blunt man". Interestingly, the house lights are up during this speech, making the audience part of the crowd too. 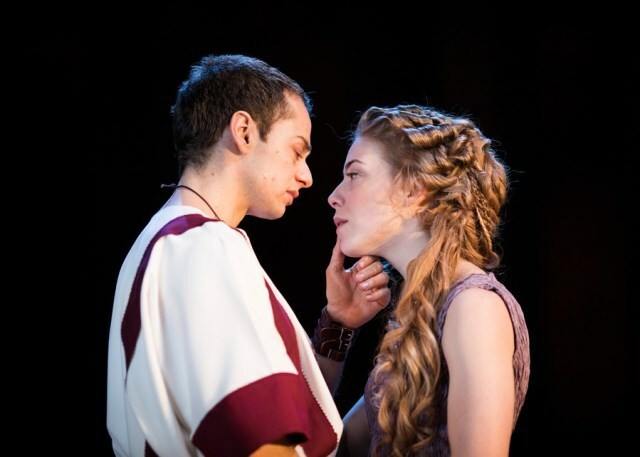 Julius Caesar is a political intense drama starring James Corrigan as Mark Antony. Photo credit Helen Maybanks. The sympathy towards the traitors adds another layer to this play and Waldmann plays Brutus with a kind gentility. His sensitive relationships with wife Portia and a servant boy turn up the emotion another notch. 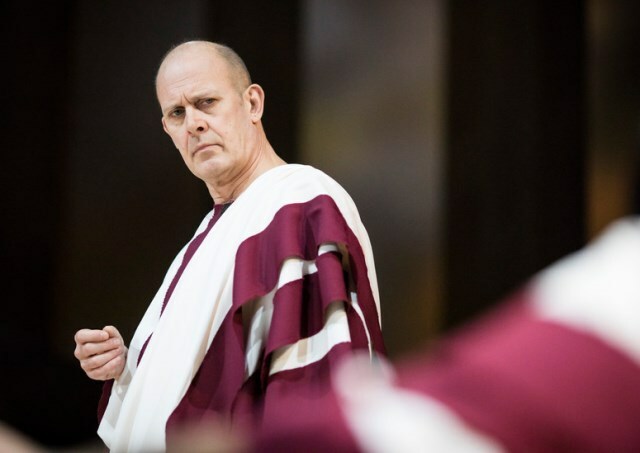 Martin Hutson is also powerful as plotter Cassius and he shows a much more ferocious and passionate drive to overthrow Caesar. There's real feeling in this latest RSC version of Julius Caesar and it's a perfect lead in to Antony and Cleopatra, which to my mind slightly edges it out of the two due to the regal performance by Josette Simon as the African queen. It's also a timely reminder that the politics of spin, game-changing speeches to rally the mob and betrayal among the elite are nothing new. March 3 - September 9, 2017. Tickets cost from £16 from the RSC box office on 01789 403493 or the RSC website.